2007 was a very busy year for Reliable Controls and our Authorized Dealer network. Overall revenues closed at just over 9% ahead of 2006. 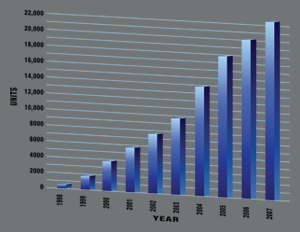 Sales of programmable microprocessor-based products topped 22,000 pieces, posting an 11% growth over 2006. Strong dealer sales made Q4 of 2007 the best quarter ever for the company. Over 100,000 programmable controllers are now installed in the field and many prominent buildings operate with Reliable Controls. For 2008, the New Year begins with a bang at the AHR Expo in New York. Significant product releases, namely the MACH-ProSys™, MACH-ProPoint™, and RC-Studio® 2.0 update 1.40 will be shipping early in the new year, and major R&D projects are planned for the balance of the year. For more information on Reliable Controls, visit our homepage.